Please note: this product has been discontinued. See the MSA Fall Protection range for more products. The TechnaCurv Harness comes in a size extra large. 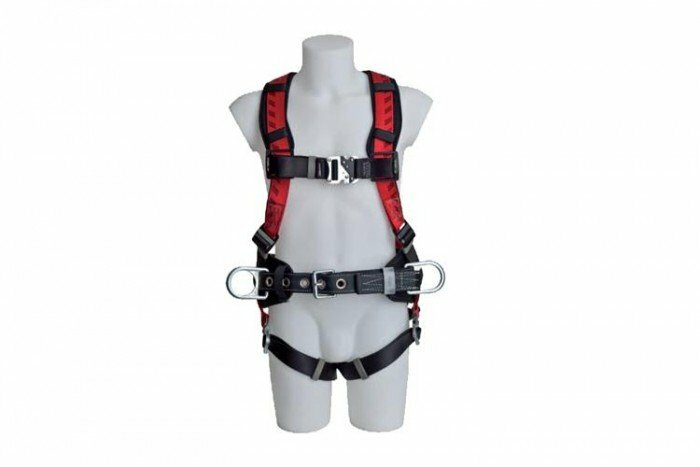 The harness also features both rear and side/hip attachments which are respectively used for fall arrest mostly for descent, ladder climbing and rescue and also work positioning activities that allow the worker to perform hands free work. The MSA TechnaCurv is a full-body harness, designed for comfortable wear. Features of the harness include a Curvilinear Comfort System, visco-elastic shoulder padding and an innovative web design. The harness has secure-fit buckles, Sorbtek fabric on the shoulder and sub-pelvic pads and an integral load indicator. MSA provide a wide range of fall arrest equipment, including full-body harnesses and accessories. The TechnaCurv has downward-adjusting torso straps to ease adjustment and variable width webbing which distributes the weight of the wearer over a wide surface area. This should increase comfort during suspension/work positioning. The width varies from 42mm to 67mm. This full-body harness from MSA is certified to EN 361, EN 358. Used for work positioning activities that allows the worker to perform hands free work.